We get crazy busy during the holidays and in order to accommodate everyone we are cutting off special orders on Dec. 18th. Everything else is first come first served. *Want to speed up the line up? Use cash please. Thank you for understanding and happy holidays!!! When ordering your turkey, it’s best to order in 3 lb increments. Green Ham/Pickled/Gammon Ham Raw $5.99 /lb bone in, rind on. $10.99/lb boneless skinless. Don’t know what to get your meat lover for the holidays? 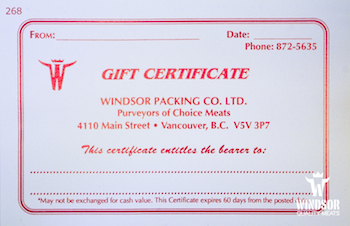 How about a Windsor gift certificate? Available in any denomination. 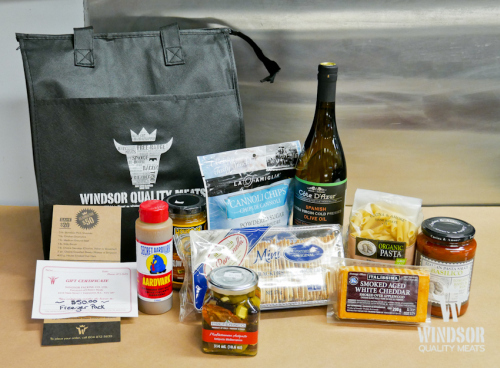 Try a $100 Gift Basket which includes a $50 Freezer Pack Gift Certificate as well as your choice of great pantry stuffers in an insulated Windsor tote bag. NOTE: We need about 2 days notice to prep turduckens and other specialty items for you. 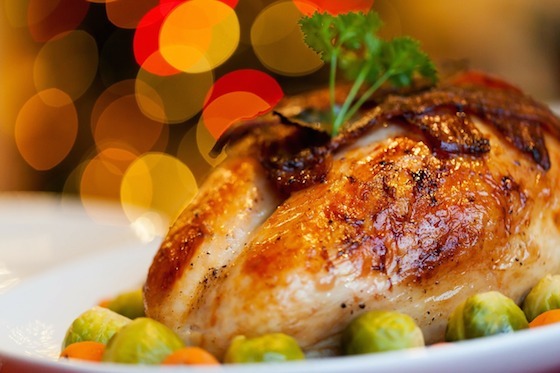 Final order date for turkeys and turduckens is Tuesday December 18th.